An odd green glow started coming up over the horizon. 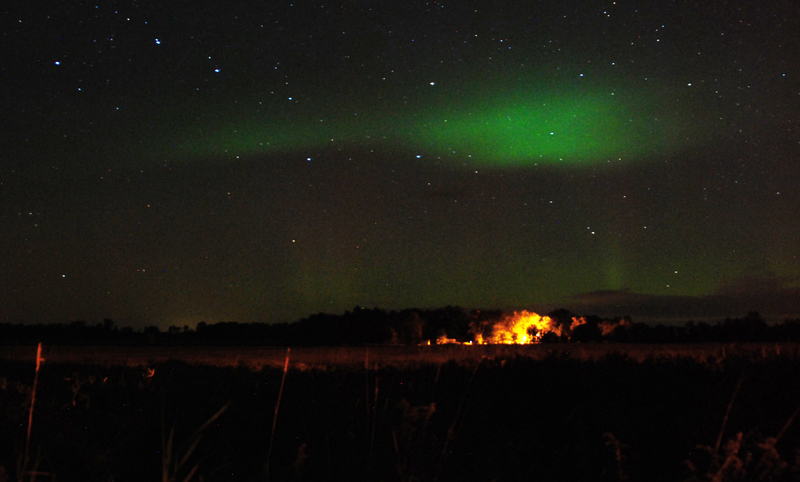 It was the Aurora Borealis more commonly called the Northern Lights. It was a great spectacle and started showing up in waves. 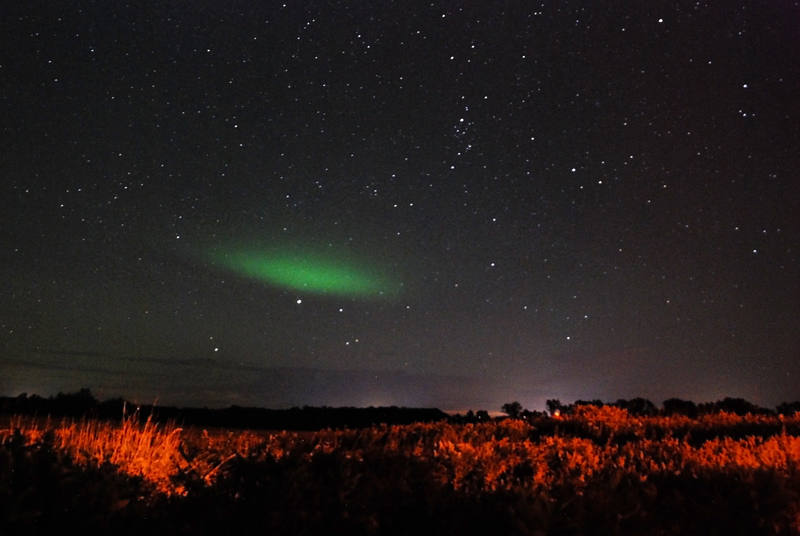 We watched as some red mixed in with the green near the Big Dipper in the great north country. It was really neat to watch the green popping up over the Road Warrior! This is what camping is all about! I went online and saw that the next night was going to be even more spectacular. Since we were in my hometown I made plans with my best friend Justin to have a bonfire at his house and enjoy the light show. I wanted to make sure to share how I approached the process to photograph the Northern Lights. Many people are surprised when they find that you don’t need an expensive camera to capture this amazing event. 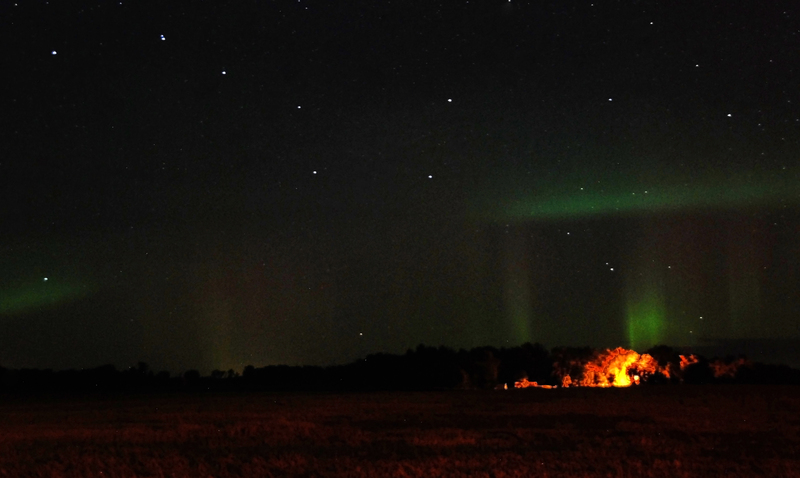 Almost any DSLR can get great pictures of the Aurora Borealis. I shoot with a Nikon D80 which is a great camera but it’s also almost 10 years old. You need to be in a Northern State for this. You’ll need to know when there is going to be a northern lights storm. We prefer to use this website. They even have a service that alerts you when it’s coming your way which is neat when you’re an RVer and want to know what nights to head outside. The next thing is that you’ll need it to be a clear night. Clouds will shut this down quick. It’s best when there isn’t a bright moon showing above the horizon. Being in a city won’t work. You’ve got to head out into the country because the ambient lights of the city will greatly affect the outcome. A DSLR camera with manual mode. The last thing you need is a lot of patience. At times there was nothing to see, for a lot of the time it was existent but not vibrant. This is when most people would get bored and stop watching, just like with most things in life you gotta stick it out. What I noticed on this night is that for around 5 hours straight we would get 1-2 spectacular surges per hour. Some of them were absolutely mind blowing. The surges would last anywhere from 3o seconds to 15 minutes. 30 seconds isn’t a lot of time and if your eyes are peeled to the sky you could easily miss it. At one point there was yellow, green and red showing up vertically and horizontally. Lastly, you can use computer software like photoshop to play with your images like the one below where I eliminated some of the faint stars in the sky to showcase the Big Dipper. 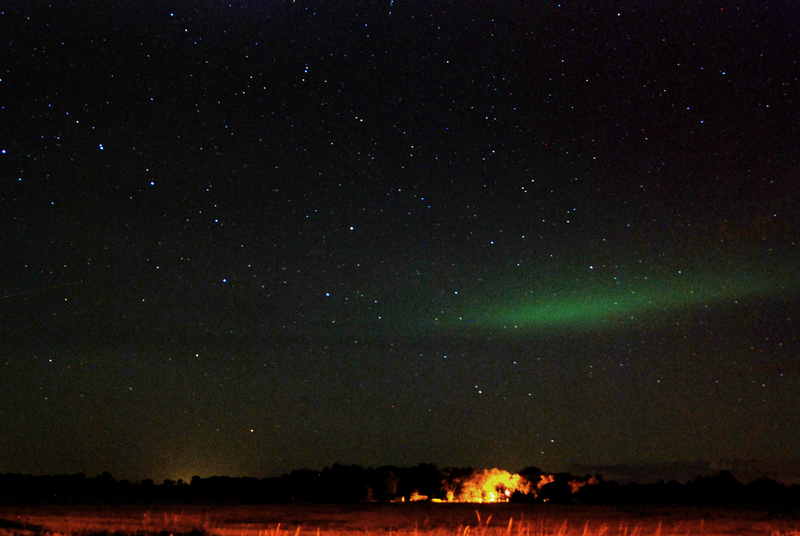 Now get out there and enjoy the Northern Lights while you enjoy this beautiful country! ← OH NO! How Do We Practice!? !